The Gallery of Lost Art, an immersive online exhibition which reveals the stories behind lost artworks from some of the world’s most famous artists, has won the Interactive Art Award at South by Southwest (SXSW), the world’s largest interactive media festival. The Gallery of Lost Art is curated by Tate, designed by digital studio ISO and produced in partnership with Channel 4, with additional support from the The Arts and Humanities Research Council (AHRC). 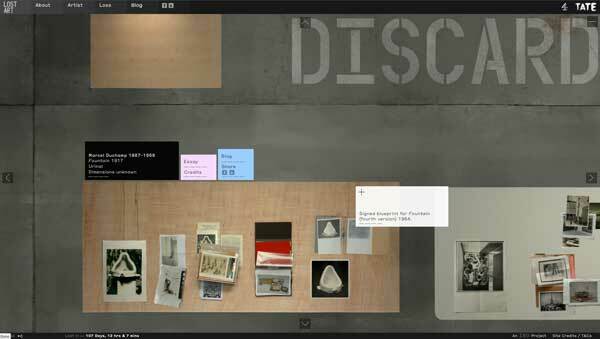 Designed by ISO for the Tate in partnership with Channel 4, the innovative project takes the form of a virtual gallery, bringing together fragments of lost treasures to be explored online. Each piece of art, now destroyed, stolen, or erased from the real world, is depicted as a table that contains an array of media fragments – all that is left of the original artworks. They include artist’s notes and letters, archive images and video, eyewitness reports and press reviews. The tables are grouped in thematic areas each dealing with a concept around loss in art. The project was created with additional support from the The Arts and Humanities Research Council (AHRC). Visitors are free to explore the individual pieces by unpacking each table and exploring the digital assets released, building a personal interpretation of the artworks as they reveal the stories behind each incident. Stacks of pictures can be revealed, high-resolution images zoomed into and explored and rich media clips played back, with supporting curatorial essays. A visitor blog allows users to ‘see behind the scenes’ of the exhibition, post their own contributions and links to the project, and engage with the curatorial staff. The British production impressed the SXSW judging panel in Austin, Texas, so much that it outshone some very strong entries from major players such as Disney, Cirque du Soleil and MoMA to win the Interactive Art award. 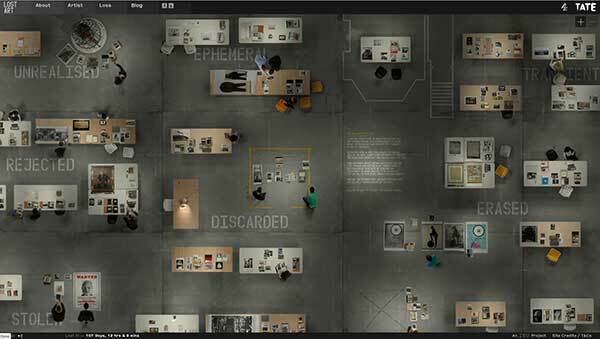 Content was researched and gathered using traditional curatorial methods by the Tate’s staff, working in parallel with ISO’s creative developers and designers. As ISO prototyped features and methods for user experience, the content would be adapted accordingly to identify rich media assets that could be best delivered by the Lost Art platform. The Gallery of Lost Art launched in July 2012 with twenty artworks, with a new work added each week for the following six months until the site was complete. Beyond these showcased works, the site provides a platform for interaction, discussion and commentary on the subject of lost art as a whole. The design by ISO includes a visitor area where users can post queries for the project curators, add comments and add other media links for each table. The project presently contains over 9 hours of material and 180,000 words. Over 500 pieces of content have been added, including essays, images, video, audio and blogs. Twenty new films were commissioned, featuring contemporary artists such as Michael Landy and The Chapman Brothers, who explain the influence and impact themes of ‘Loss’ have had on their work. Channel 4 is to broadcast documentaries specially created within the project as part of its ‘Shooting Gallery’ strand. The project itself will become ‘lost’ when the site is destroyed in July, leaving behind a trail of digital fragments. The Gallery of Lost Art will live on as both an iBook and a physical book.